SIS LIVE: iDirect-based IP services to uplink vehicles. Milton Keynes, 5th November 2013: Satellite connectivity and broadcast expert SIS LIVE has announced the installation of a brand new iDirect hub at MediaCityUK, Salford. This will operate from SIS LIVE’s state of the art Salford teleport to provide comprehensive IP services to major UK and overseas customers. The new hub will work alongside the existing SIS LIVE iDirect services which have operated out of their Milton Keynes teleport since 2007 and will provide greater resilience and the development and expansion of new IP over satellite services. 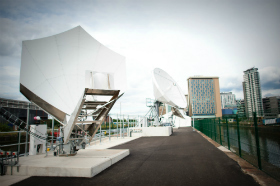 The iDirect hub, operating on the latest Evolution iDX 3.2 software will run on multiple satellites including a new SIS Ka Band service utlising an 8.1m antenna at SIS LIVE’s MediaCityUK teleport. Combined with iDirect’s new X7 modems users can expect great throughput performance. The multi-satellite hub will provide iDirect-based IP services to well over 100 SIS LIVE uplink vehicles. SIS LIVE will also build and deliver up to 20 new Ka band uplinks in 2014.The new Ka band services push SIS LIVE once again to the forefront of innovative use of technology to simplify and reduce cost for their customers’ contribution and delivery. SIS LIVE’s engineers have developed a system to allow both DVB carriers and iDirect-based IP carriers to share the same satellite capacity allowing users to maximize the value of their expensive satellite capacity, optimizing service levels and reducing costs. The service will allow broadcasters to deliver from ‘source to studio’ file-based content and continue to use efficient DVB video encoders for low latency high bit rate live broadcasts. SIS LIVE’s Research and Development team are already working on a new version of this DVB/IP sharing system which will use uBook, SIS LIVE’s fully integrated, online booking system, affording users full flexibility and immediate control over both DVB and IP transmissions.